The gift of Salvation is yours to accept, but we understand that you may wish to talk to someone personally about taking that step. Several people from the Samson Christian Slo-Pitch League have volunteered to talk to you, answer the questions you may have, and most importantly pray with you. Just complete the form below and somebody will be in touch. 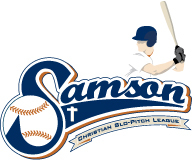 The Samson Christian Slo-Pitch League features 20 teams representing 16 churches in London and Strathroy. We believe that Jesus came to Earth and was crucified, arose from the dead, and faith alone in Him is the only grounds for salvation.